I am constantly learning about what it means to be me. What it means to be a woman. What it means to be passionate, soulful, sensuous, crazy, overwhelmed and stunned by the touchable transparency of now. It’s insanely early. The bright shining stars and moon woke me up and there was really no point in fighting it. I have learned to recognize these nights when in my heart, sleeping seems like the least important thing to do (my brain does not agree). After many warming cups of lemon balm tea and journaling the night turns to day. Pink flares of daylight start to spread across the sky and remind me that a new day is ahead. The gap of time seems to float away and I say goodbye. Until next time. I prepare myself for a a day in the life of me and feel pretty damn happy that I get to live in this body, in this life, as a woman and as Elenore. However it was not always like that. Scroll down a bit and look at that picture of me wearing a red/purple hat and a golden sweater. You would not have caught me dead in that outfit some 10 years ago. It would have been to girly and god knows I did not want that. The truth is that I recoiled from anything too girly and thought it made me seem weak. Isn’t that incredibly sad!? Baggy jeans and dreaming about rocking a skateboard was my tune and it wasn’t until many years later I realized that I wanted to embrace the my femininity and REALLY LOVE IT. So now I do (+constantly learning). A great thing is that I no longer feel the need to step back from long dresses, large earrings, sensuous living and crazy dancing to tunes like ”girls run the world”. Haha.. Oh and pink food is TOTALLY ok. Especially when it´s this tasty. When I started to learn more about Greenylicious healthy foods i fell really hard for Buckwheat which is a naturally gluten free grain (it’s actually a seed). Then came Quinoa, Amaranth and Millet but that’s another story. These gluten free nutrition powerhouses are so versatile and it’s almost insane when you think about how people all over consume cereal grains. See, a simple swap to the gluten free ones and it would change so much! 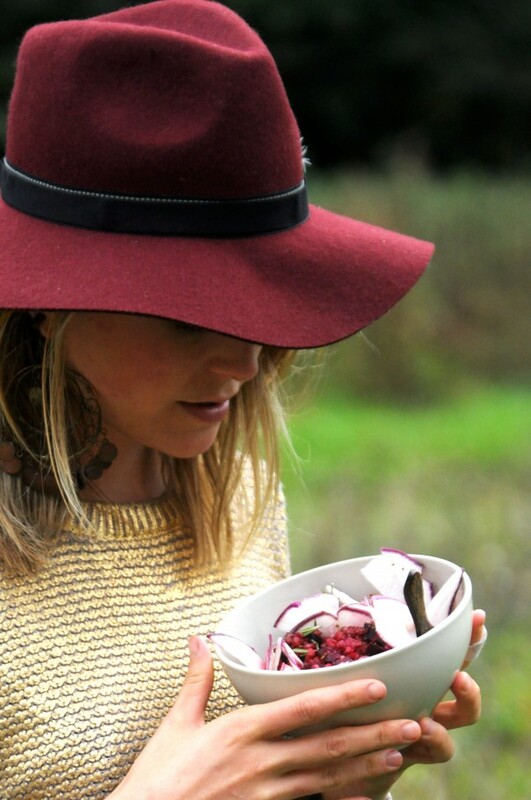 I sprout Buckwheat for my Raw seed granola, salads and incorporate cooked ones in soups to get that creamy constancy. Oh and not to mention burgers..olala, buckwheat burgers (raw or baked) with lots of fresh herbs and sun dried tomatoes, but that’s another story as well. Elenore, keep your focus! Buckwheat (Fagopyrum esculentum) is a flowering beautiful plant that enriches the earth tremendously. 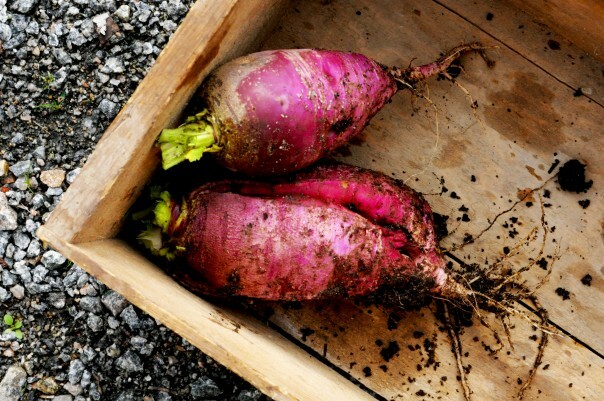 It’s commonly grown where the earth needs to rest and get a mineral boost so it’s not only great to consume, it’s amazing for the planet as well . Hooray! In our human body its reduces toxic acidic waste and balances the pH-level by being alkaline. For all you protein focused people out there I can happily announce that Buckwheat is also a complete protein (it contains all essential amino acids). Buckwheat is often times what I cook when I’m really hungry since it has the longest transit time in the gut and therefore is the most filling and blood stabilizing ”grain”. Plus it reduces excess cholesterol. I don’t think I need to continue. 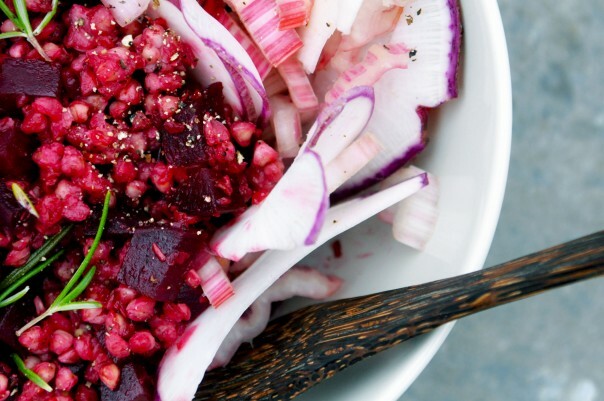 Get your Buckwheat on! A perfect dish for these first chilly days of fall, not to mention how incredibly beautiful it is! You can choose to either eat the raw veggies on the side or incorporate them with the cooked, creamy and very fragrant Buckwheat. 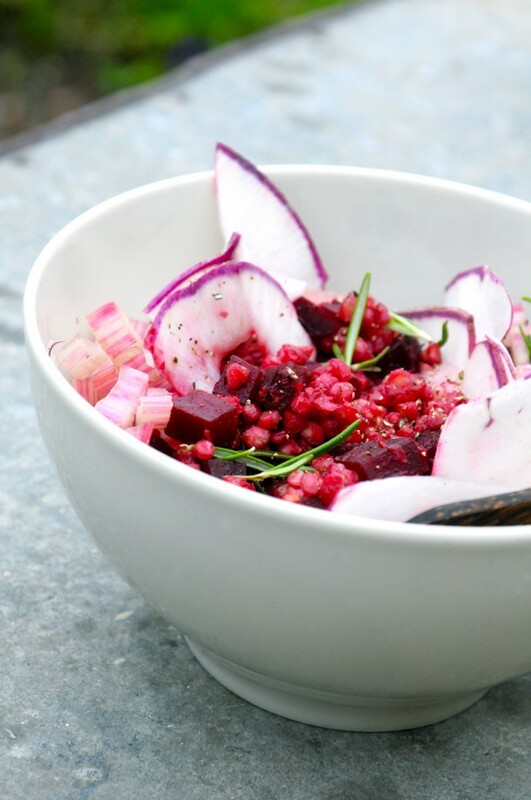 Start by making the plain Buckwheat in one saucepan and the beet root dish in another. Prepare the raw vegetables during. Ps. This meal is like a hug. 1. 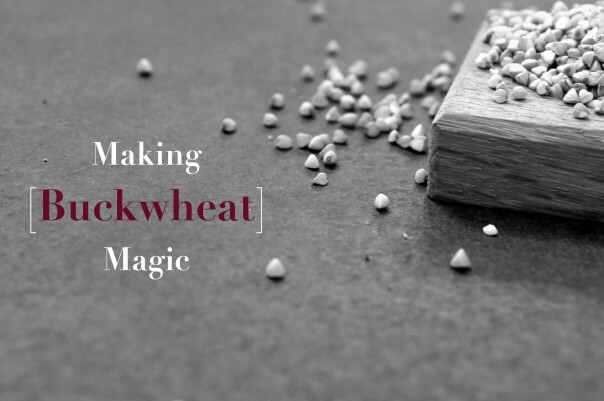 Cover the Buckwheat with cold water and stir a bit with your fingers. Rinse them thoroughly in fresh cold water. 2. Now add Buckwheat and the 1.5 cup water to a saucepan and cook at medium temperature for 15 minutes. (Add the salt towards the end). 1. Prepare all ingredients and heat the coconut oil on medium temperature in a saucepan. 2. Add the garlic when the oil is warm and after a minute add the rest of the ingredients except the fresh rosemary. 3. Cook at medium temperature with the lid on for 5-7 minutes (add the rosemary after 4 minutes). 4. Combine with the cooked Buckwheat. Add all goodies to a bowl and top with some fresh Rosemary, freshly cracked black pepper and a tsp good quality olive oil. 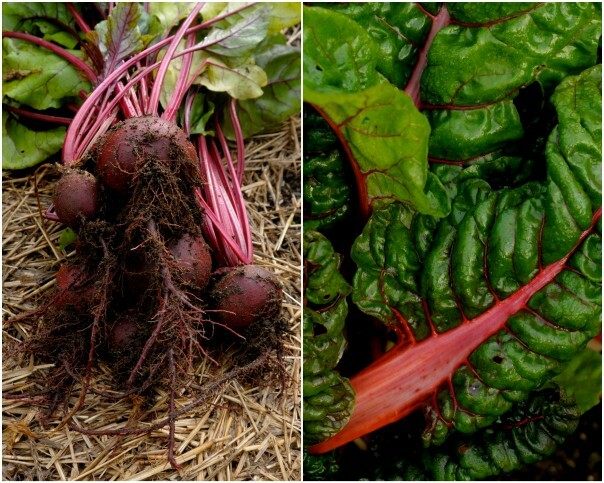 Now I’m trying to think of other pink or red foods that I can incorporate in my meals… Any ideas? What do you use when you feel like indulging in this hearty warm color? Leave your awesome ideas and tips in the comments below! …and head over to join the Earthsprouty community at Facebook and Twitter where the conversation is ongoing and filled with crazy healthy joy.